Although summer camp is still in its infancy, one event that’s already become a tradition is the drill ride. 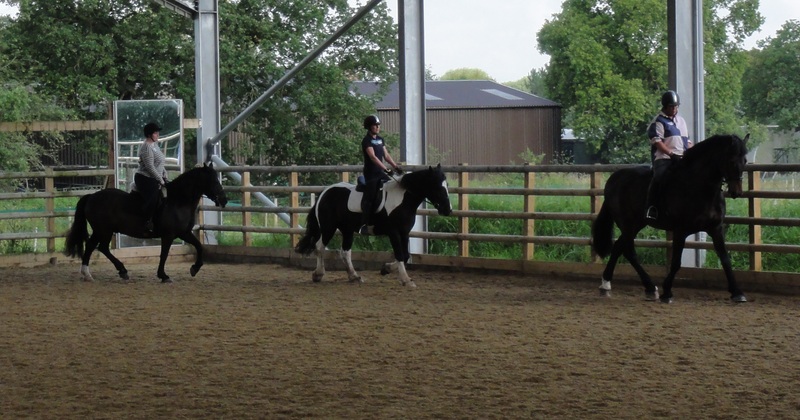 The first practice for this generally takes place early on the first day, to give the horses a chance to settle in their new environment and get used to being ridden in groups. We were very lucky to have Pam Rigby’s expertise for the drill ride. Pam competed several times in the British Riding Club Quadrille at Wembley, and knows all the tricks to prevent us from crashing into each other! We were quickly divided into two groups of six, matching horses of a similar size and pace, and set off for our first practice. Pam lined up my group of six, and sent us trotting round the arena. When all the horses were moving along the long side, we all turned across the school simultaneously, riding side by side and trying to keep in line. 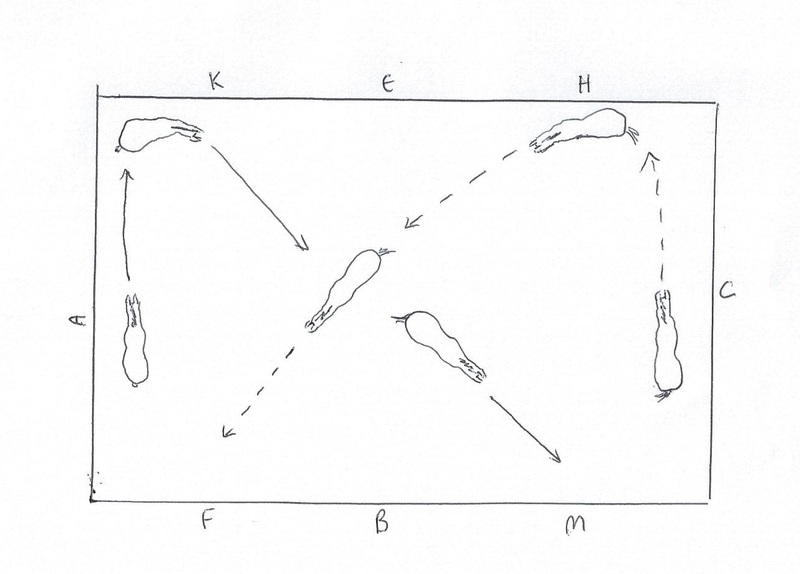 When we reached the opposite side, we all turned right, so that the lead horse ended up at the back. Ride 1 practice the drill ride. L to r Melissa with Harry, Kim with Ted and Debbie with Jake. “When you do the turn, watch the lead horse for pace, and try to keep in line,” explained Pam. “This is called ‘dressing'”. We had a couple of goes at the turn, which went fairly smoothly once we’d learnt not to cut the corner at the end, which was resulting in us crowding each other. Dizzy with success, we decided to try something a little harder – the scissors manoeuvre. This involved each horse trotting diagonally across the school, and crossing with the horse coming from the opposite corner. Riding ‘scissors’ so that the horses interlink. After adding in a couple of other manoeuvres – including a double circle, which it took us a while to work out how to get out of – we were ready to bring in the music. Soon, the strains of the Beatles’ When I’m 64 were floating through the arena, and the horses pricked up their ears and started to trot more jauntily, keeping time to the music. “I’m bringing in the music very quietly for these horses, who aren’t used to it,” explained Pam. “Once they’ve all settled, I’ll turn it up gradually.” A second, less energetic piece of music marked the walk sections. All turn across the arena, divide into two rides of three. One group turns right, the other left. Work out how to get out of double circle – not easy! Halt on the centre line and salute. After a couple of goes, we were all absolutely perfect. Ahem. Fortunately the ‘live performance’ wasn’t until the next day, so there was still plenty of time to practice….